Enjoy Candle Light Tours at the Wallace House and Old Dutch Parsonage - December 9, 2017 ~ The History Girl! On Saturday, December 9, from 6:00 pm until 9:00 pm, there will be hourly group tours by candle-light, featuring costumed interpreters, hearthside cooking presentations, and refreshments, at the Wallace House and Old Dutch Parsonage State Historic sites. 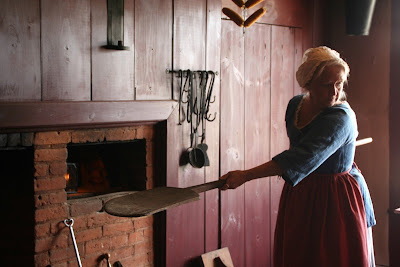 Reenactor Kathy Ormosi demonstrates use of the bake oven. Photo supplied by Wallace House and Old Dutch Parsonage State Historic sites. Join Mrs. Mary Wallace when she steps out of her portrait frame on the evening of December 9 to guide groups of visitors around her home, taking them back in time to the memorable winter of 1778. She will talk about the simple ways in which she and her husband, John Wallace, plan to celebrate the upcoming holidays, the inconveniences she anticipates when General George Washington and his entourage return from Philadelphia to stay at her house, and provide insight into the disruptions of the Revolution and how they have affected her family life. Moving on to the Wallace House kitchen wing, visitors will see re-enactor Kathy Ormosi presenting hearthside cooking, and discussing the foods of the season. Finally they will adjourn to the nearby Old Dutch Parsonage, where they can enjoy light refreshments. There is ten dollar per-person fee to attend this program. All visitors must register for this program in advance. Visitors may register for the 6:00 pm, 7:00 pm or 8:00 pm tour. Each hourly tour will be limited to ten visitors per group. Call 908-725-1015 to register. Please register early. Private candlelight tours for groups of five to ten people can also be scheduled, from December 2017 to March 2018. Reservations must be made at least two weeks in advance. There is a ten dollar fee per person for private evening candlelight tours. 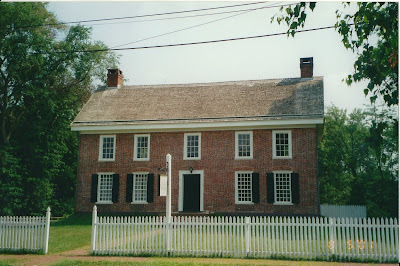 1751 Old Dutch Parsonage historic site.